MUMBAI: The sounds of Garba sticks, sparkling dresses and the rhythm of dance was with the thousands of people who attended raas garba night at siliguri .Radio misty 94.3 fm partnered with siliguri yuva jagriti sangh and marwari yuva manch to celebrate this festive spirit. To make this festive season more joyful Radio Misty gave awards for best dancers, Dress and other categories. TV star Karan Singh Grover (Dr Arman) was present with people to dance on beats of drums in garba raas organized by yuva jagritri sangh in association with radio misty 94.3 fm. Garba raas with marwari yuva manch had a huge turnout from people from different walk of life. Radio Misty gave away awards on this occasion. Live update was made on Radio from the venue. 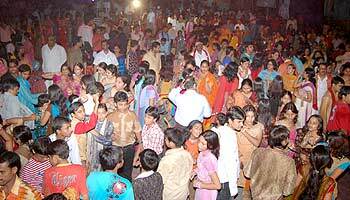 Radio misty chief executive officer Nishant Mittal said that Navratri celebrations are incomplete without dandia, garba and folk music. We have tried to connect people with this special shows and the response has been tremendous.